UPDATED: October 20, 2014, at 2:45 a.m.
Harvard affiliates wishing to travel on University business to the countries most affected by Ebola must now obtain the approval of University Provost Alan M. Garber ’76 and their respective School dean, according to a new set of guidelines the University disseminated on Friday. Unrelated to that approval process, the new policy also mandates that any Harvard affiliate returning from Sierra Leone, Guinea, and Liberia must complete a medical screening with Harvard University Health Services before arriving on campus. Travelers could also be asked to stay away from campus for 21 days, the length of the virus’s incubation period. The guidelines, outlined in an email from Garber and UHS Director Paul J. Barreira, expand on those detailed in August that asked for Harvard students, faculty, and staff to avoid nonessential travel to the three countries. In an interview Friday, University President Drew G. Faust added that UHS is also undertaking a set of planning exercises to prepare for a case of Ebola at the University, training staff so that they can properly respond and recognize the disease. “The CDC is working out its procedures, the President’s sitting in the White House trying to figure out what the next steps are, so we’re all very eager to do the right thing and define the parameters of our engagement,” Faust said. She added that Harvard researchers, particularly those working in public health, have the potential to play a large role in addressing the outbreak. Still, Harvard’s latest round of efforts to head off the epidemic for affiliates comes with the acknowledgement that the social, political, and medical climate in the region may make it difficult for the University to aid individuals once they are there. “To contribute effectively in-country entails great personal risk and requires complex logistical support, which only a few aid organizations and governments are capable of providing. Only clinicians with the highest level of readiness—personal, mental, and professional—should even consider traveling,” the guidelines from Harvard Global Support Services read. Inquiries to University officials regarding the number of affiliates on the ground in Sierra Leone, Guinea, and Liberia were not immediately answered. 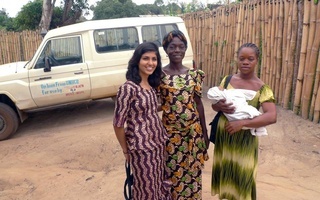 In one high-profile case, University Professor Paul E. Farmer and associate professor of medicine Joia Mukherjee travelled to Liberia in mid-September to assess conditions on the ground. 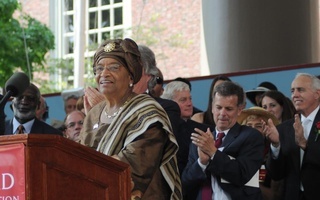 They met with Liberian President Ellen Johnson Sirleaf, a 1971 Kennedy School alumna. Both were working in their capacity as leaders of the global health organization Partners in Health and were not sponsored by Harvard. Farmer did however participate in a Harvard global health event via video from Monrovia, Liberia. Garber and Barreira wrote on Friday that the University has not identified any University affiliate or campus visitor who has been deemed to be at elevated risk for Ebola to date. The updated policy comes as tests of a Yale graduate student suspected of having contracted Ebola came back negative last week. The patient recently returned from researching the Ebola outbreak in Liberia and was admitted to Yale-New Haven Hospital with “Ebola-like symptoms” on Wednesday night. —Staff writer Amna H. Hashmi can be reached at amna.hashmi@thecrimson.com. Follow him on Twitter @amna_hashmi. "LESS DANGER IN LIBERIA THAN HARVARD SQUARE"